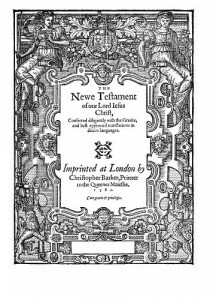 Call me Captain Obvious if you like, but the New Testament is shorter than the Old Testament. I was thinking about this the other day and it occurred to me that in some sense the length of the two covenant documents speaks to the relationship between the covenants themselves and what is required of the people who are part of those covenants. One of the things that makes the Old Testament longer is the accumulation of stories of family lines. So, for example, the story of Judah and Tamar in Genesis 38 is vital because it records God’s preservation of the line of Judah. The Old Testament is filled with both genealogies and narratives that preserve bloodlines. The New Testament, on the other hand, has no genealogies (except for that of Jesus, which is the climax of the Old Testament). There are no stories of fathers and children, no stories of family lines being preserved. This makes the New Testament shorter. It also illustrates one of the fundamental differences between the covenants. The older covenant was passed on from generation to generation through bloodlines and families (Gen 15.3-5), while the newer is passed on through gospel proclamation and faith (2 Tim 2.2). Therefore, the New Testament simply has the book of Acts which records how the gospel was proclaimed and believed. That’s all there is for narrative. There is no ongoing record of families which must be saved because God’s people will now be made up of ‘all nations’ as they become disciplines… adopted children. In the New Testament, however, there is a distinct lack of laws (note: I didn’t say distinct lack of Law). You would think that as the New Covenant was being received and applied across cultural boundaries and geographical regions and religious backgrounds there would be a lot more Acts 15-type-moments. But in reality, there aren’t, simply because the New Covenant isn’t about setting case law. That’s not the nature of this covenant. For example, when the Corinthians ask Paul about whether or not they are free to eat meat sacrificed to idols, he does not deliver case law that is binding on all Christians. 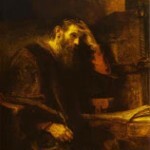 Rather, he holds up the ideal of freedom and then allows it to be swallowed up by the law of love so that individual Christians simply cannot answer the ethical question without coming face to face with the question, ‘What is love and am I willing to be governed by it?’ (see 1 Corinthians 8-10). He does the same thing again when it comes to the exercise of spiritual gifts (see 1 Corinthians 12-14). Love is the law that governs all of Christian behaviour in the New Testament (John 13.34-35). When you’ve only got one law that trumps in any and every situation, and you don’t have to record genealogies and family histories spanning thousands of years, you can write a much shorter covenant document. Which is precisely what we have. How Do You Feel About Predestination?